Every day, people use the Bentley Historical Library to uncover the story behind the story: history from a new angle, a lost perspective, a forgotten voice. When you make a gift to the Bentley, you’re making an investment not just in letters, photographs, books, and more but in the power of Michigan’s history. There’s no time like the present to support Michigan’s past. 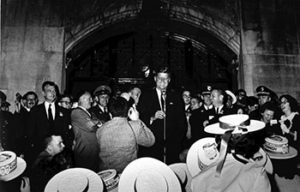 Many of us have seen it: The iconic black and white image of President Kennedy standing on the Union steps in October 1960, a crowd all around him as he gives an impassioned speech about what would later become the Peace Corps. The image is housed in the Bentley—image BL000107 to be exact. But did you know there’s a color version of that same photo, taken from an even better angle? 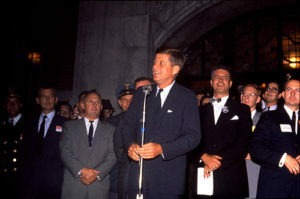 U-M student Frederick L. Shippey had his camera with him that night and captured vibrant images that give us more detail about that evening, including accurate identities of the people on the steps with Kennedy. This photo is part of new digitization projects at the Bentley that can give our users unprecedented access to our materials. Right now, only a fraction of our collections are digitized and available online. Please make a gift today to put more of Michigan’s incredible history online through the Bentley’s digitized collections.